What’s so mysterious about black cats? One of the common images seen in crime and mystery stories as well as Halloween decorations is that of a black cat prowling in the night, a sinister and evil figure. Yet most black cats are just as friendly and playful as other cats. In the words of Curly Howard, they’re “a victim of circumstance!” How did black cats get such a bum rap? A black cat is not a specific breed. The Cat Fanciers Association allows solid black coloring in 22 of its recognized breeds. The only breed with all-black felines is the Bombay, produced by mating a Burmese with a black American Shorthair. Male cats are more likely to be black than females. 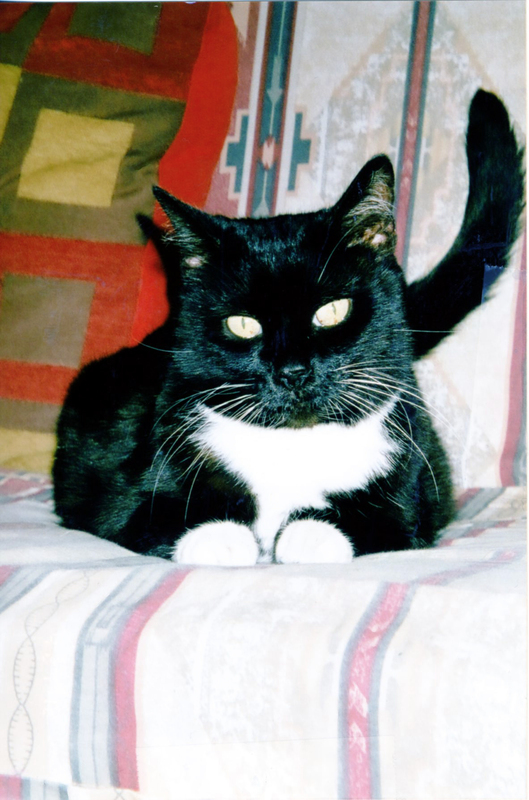 A common variation on the color is the “tuxedo cat,” a black cat with a white chest and sometimes white paws, as illustrated by my dumpling, Boots. Pop culture has produced such black cat heroes as Felix, who debuted in 1920s silent cartoons, and Snowball II of “The Simpsons.” In the 1970s John Lennon had a black cat named Salt and a white one dubbed Pepper. Black cats were not always stigmatized. In Egypt around 3,000 B.C., cats were worshiped. The goddess Bast (also spelled Baast or Bastet) was often depicted as a black cat or a woman with the head of a cat. Killing a cat was a capital offense, and dead cats were often mummified. As early as 1,000 B.C. cats were domesticated as pets. In Asia and Scotland, black cats are considered lucky. But in Europe during the Middle Ages, cats were seen as the familiars of witches. The sight of poor, single women feeding feral cats gave rise to this idea. The belief was that cats could change into human form and spy on persons. Early settlers to America brought their superstitions with them. In the 1300s, communities killed hundreds of cats, resulting in a rise in the number of rats that then spreaded bubonic plague, the “Black Death” that killed millions of Europeans. In modern times, blacks still have bad luck. In animal shelters, black cats are often the last color of animal adopted and the first that is put to sleep. Shelters often have more black cats than any other cat color. One local shelter stated that guests often see the more brightly colored animals before they notice the black cats, so the darker pets are often missed. This is Felix, a stray that some people found and turned over to my vet for treatment and who ended up in my house. Pet owners in England are ditching their black cats because they claim the animals don’t photography well in selfies, according to www.mirror.co.uk. The RSPCA (Royal Society for the Prevention of Cruelty to Animals) reports that 70 percent of the unwanted cats housed in its national animal centres in England are black or black and white. But according to my experience, black cats make wonderful pets. I don’t know why but all of my cats have been gray or black. I didn’t set out as a “black-only” owner; in one case the cat chose me. Maybe these felines know I’m a sucker for an outcast or a hard-luck story. So next time you’re writing that detective story, pause before putting that black cat in a dark alleyway. Why not make it white dog? This post is based on an article previously published in the Acorn Newsapers. This entry was posted in Sally Carpenter. Bookmark the permalink. 12 Responses to What’s so mysterious about black cats? Cats are great no matter the color. They add a lot to a person’s life, and almost seem like part of the author’s arsenal. Good post! Thanks for stopping by, Marilyn. Cat mysteries are very popular. I’ve thought about writing one myself but with all the competition I’m not sure how I’d stand out in the crowd. The spying-on-people belief lives on. A friend in Truth or Consequences told me that someone else in town claims that cats are intelligent aliens observing us and reporting back to the mother ship. (Welcome to T or C.) The town is full of cats, but I’m not sure they’re all that interested in us. Great post. My cats are interested in me only as their feeding machine. There isn’t much to report on my life and besides, my pigs-with-fur are too busy snoozing to spy on me. I shared this in memory of Pirate and Elvis, my two black guys who have crossed to the Rainbow Bridge. Both of my black cats have been super loving and playful. Nothing to fear in either. Both were rescues, Pirate was in a high kill shelter, and Elvis had been dumped in NH, probably because he was older (vet estimated around 11-13) and had a raging thyroid condition. So, black cats, bad luck? Nope, just the opposite! Felix was a rescue of sorts. Some people found him as a stray. He was injured so they took him to my vet. They wanted to adopt him but he didn’t get along with their cats. When I took my sick cat to the vet, Felix would hop in my lap and rub on me. He knew a “sucker” when he saw one! So I eventually took him home. Loved your post! The best cat I ever had, Memphis, was black, and I’ve had a bunch over the years. Interesting that black cats are more often male than female. 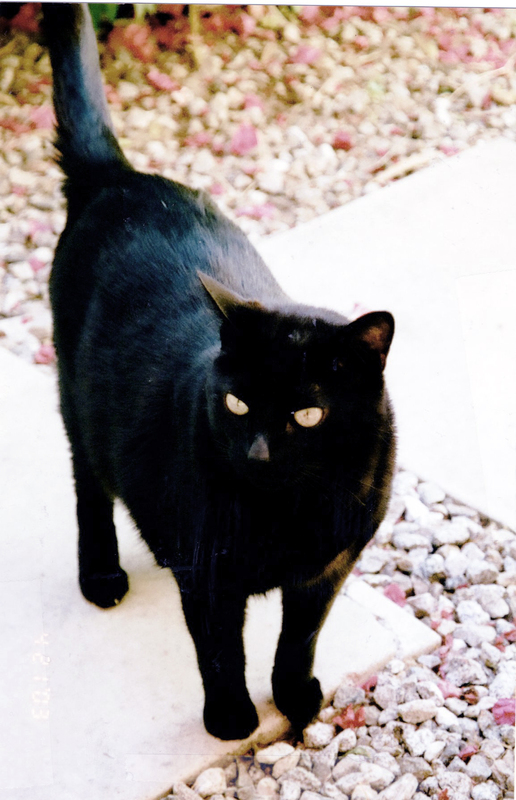 My previous black cat, Snuggles, was also a (neutered) male. When I was a kid I had a grey cat that was male. Boots is a girl. I wonder if black is the dominate color if two cats of different color mate. I loved your post. It is so true the fear about black cats. Both of our cats are rescues. We have two black cats one who is full black female and the other is a tuxedo male who one would think he is a girl for all the grooming he does compared to our female. Our tuxedo was our fist cat and while they do play at times, they don’t care for one another. Mr. Perkins would rather beat the crap out of Lady Morgana. She is clearly my cat while he is clearly my husbands. This changed as before we brought the new sickly girl into our home, Mr. Perkins wouldn’t leave my sight but Morgana was in quarantine until she stopped sneezing we had to decontaminate the room for all the sneezing. She spent two harrowing weeks in that room, often alone. Although my husband would get up and sleep with her to make sure she wasn’t alone. So one would think she would naturally be his cat. Nope, the instant she was well and could interact, she suddenly was my cat. I was home all day working, and she pushed Mr. Perkins away. Now he doesn’t care much for her. They tolerate each other. But she rarely leaves my side. To think she was and her three brothers were shoved into a black garbage bag a jogger found on the side of the road and taken to the shelter. It sickens me. Even Mr. Perkins who was the cutest cat in his litter, was the last to be adopted buy us. But they are two of the most loved and spoiled felines I know. I know the fate of Morgana’s brothers. I often feel guilty, perhaps if they were girls they all would have had a home. We had to think of our Mr. Perkins our dominate male. Who now has lost that role. Morgana rules the roost. Thanks again for your great post. Thanks for stopping by. I was told Felix didn’t like other cats but after a few years he now tolerates the others and will even groom them. He’ll also snuggle with them on the porch. Thanks for your comment. Black cats have their own type of beauty. But what’s hard is trying to find them outside the house at night; they blend in with darkness.